I bought a seasonal kit of Excia AL Renewing Extra Milk SV kit. There are some small bottles are included with one full bottle of milk. 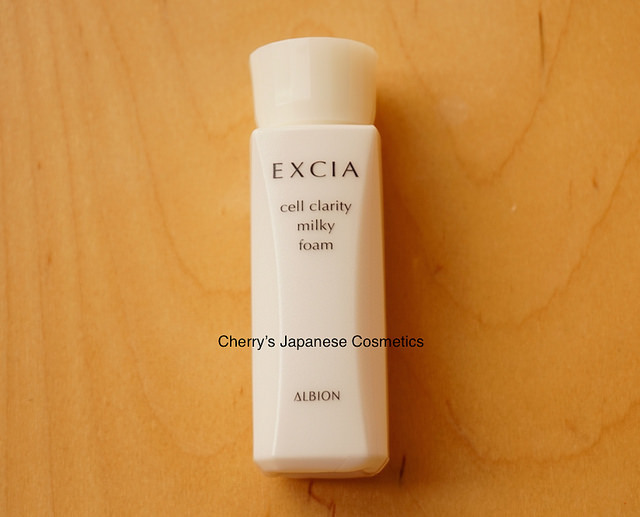 Here is a review of Albion Excia AL Cell Clarity Milky Form, this is new for AW 2016. Foam, yes, this is a face wash. This is a liquid face wash, and why “Milky”? Here you are. It is really sticky emulsion, they describe as “milky”. Please add few drops of water, and rub, rub,and rub.. It is super easy to earn rich foam. I know there are people who are bad at earning, I recommend to use foaming net. Or if you do not have foaming net, my second recommend is a bath lily. Anyway, this foam is rich, but so soft. there is scent, but acceptable. If you are a person who dislike perfumed skin care products even face washes, this is not for you. Afterward of my skin washed by this foam, it is not pretty bad. It washes my skin really clearly but not makes my skin so much dry. Still I recommend to use something moisturizers of your favorite after this face wash.
Total to say, it will be nice to if you are looking for something gentle face wash, and super easy to earn a whip. Please check the latest price, and order from here: “Albion Excia AL Cell Clarity Milky Foam”, or in JPY Branch! Sarah of HK also bought the selection kit. And she wrote a review for us. Thank you, Sarah! Luckily I got some small bottles as gifts. Didn’t have the time to try till now. I’m very happy to discover this milky foam by Excia that is so soft and gentle that I believe I can use it every day, especially in summer. scent, which is what I love too. The best and the most important is the effect- the cleansing is excellently just right. It feels like it hasn’t taken away any moisture from my skin (I believe it does, but I don’t feel it.) It feels clean but not drying. It seems Excia is the brand for me. I’m gonna try the other products. If you want to have these “Selection Kit”, you have to wait for Sep – Oct of 2017. But we do not promise whether we can obtain or not.